For those of us that live in Texas, this is been a particularly trying summer. With record-setting temperatures and unbearable heatwaves, keeping your family cool and comfortable is of the utmost priority. The lack of rainfall has been hard for many, and this lack of plentiful moisture can take a toll on your lawn’s health. 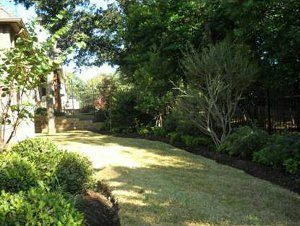 Our Fort Worth TX lawn care experts at Blooms Landcare can offer you additional information on how to keep your lawn looking its best during this drought. In a drought such as this one, it is crucial to remember not to mow your lawn if you do not see growth. Excessive mowing will simply damage your lawn and make it more vulnerable to sun damage. The weight of the lawn mower can also damage your already fragile grass. If your grass is indeed growing, it is best to mow at night, when you won’t have to contend with the sun’s warm rays. Making sure your mower blades are sharp and efficient, as well as raising the height of your grass will also help make for a healthier and fuller lawn. It is also important to ensure that your lawn is receiving the adequate water levels it needs. This is where your irrigation system is essential. It is extremely important to make sure your irrigation system is covering all areas of your lawn, however. If you notice brown or yellow patches assorted throughout your lawn, this could mean that your irrigation system is not accurately covering you entire lawn. Our lawn care experts can make sure your system is running efficiently and providing the coverage your lawn so desperately needs. For more information regarding sufficient lawn maintenance during this drought, give us a call at (817) 688-5352 or contact us online today.